In order to pick the right products, it is crucial to first identify your skin type, which is determined by how much -- or how little -- oil your skin produces. Genes, diet, stress level, medication and even your skincare regimen all determine how much oil your skin produces. Not sure of your skin type? Take this simple skin test at home to find out. Wash your face, pat it dry, then take a few pieces of rice paper or lens-cleaning tissue paper and press on different spots on your face. If your skin is oily, the paper will stick, pick up oily spots and become translucent. If the paper doesn't stick or pick up any oily spots, your skin is dry. If it sticks in your t-zone (forehead, nose and chin) then you have combination (or normal) skin. About 70 percent of women have combination skin. Here are the four different skin types and their characteristics. Type 1: Dry-Mature: Dry skin feels tight, especially after cleansing. It has a tendency towards fine wrinkles, flaking and red patches. As you mature your skin becomes drier. There are two main causes of dry skin: a weakness in the keratin (the outer structural layer of the skin) and a breakdown in the lipids. Keratin needs water to keep it healthy. Lipids work as the mortar that bonds skin cells and helps to form a tight, protective barrier. By using the right moisturizers, you can trap water in the skin and even repair the damaged lipid barrier. DAILY CARE: Use a gentle cleansing gel to remove makeup and debris. Moisturizer is much more effective on properly exfoliated skin so do exfoliate on a weekly or semi-weekly basis with a gentle facial scrub. Anti aging serums penetrate better too. Use a serum daily to rejuvenate your skin cells to pump up fine lines and wrinkles. A rich night cream is a must for that all-important beauty sleep. Type 2: Normal-Combination: What does normal mean anyway? When we’re talking about skin, it means you are one of the lucky ones! If you don’t have a problem with oil or breakouts, and don’t feel that your skin is dry and tight, you probably fall into the normal skin type range with medium pores, a smooth and even texture, good circulation and a healthy color. But over time a Normal skin type can change and become a Combination skin type with dryness on the cheeks while being oily in the t-zone (forehead, nose and chin). The trick for caring for combination skin is finding a product that will help prevent breakouts and control oiliness in the problem areas while still keeping the cheeks well moisturized. 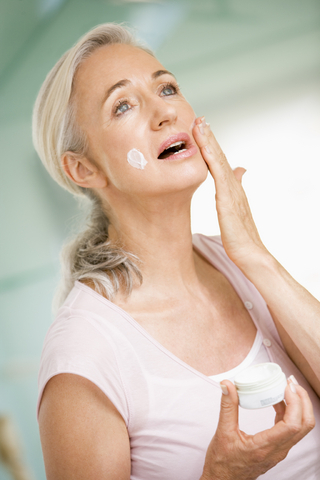 DAILY CARE: Look for products in a serum or lightweight lotion form. These can easily be layered with moisturizers or acne fighting serums. Retinol or Alpha Hydroxy Acids work well for controlling the oil and breakouts, and for getting rid of fine lines and wrinkles. In the right concentrations, they are non-drying, so they can be used on the dry areas of the face as well. There are a variety of skin care options for normal skin, many of which contain anti-aging and antioxidant ingredients. Just be careful that your homecare regimen does not strip yourskin of moisture. Type 3: Oily-Acne prone: Oily skin tends to be shiny with enlarged pores, and is prone to blackheads and blemishes not only on your face but also on your back and chest You might also experience some tightness. Oily skin is very common for people in their teens and early 20's. But for some people, it doesn't end there and it is not unusual to have oily skin in your 30's and beyond. DAILY CARE: You should always cleanse using a gel or soufflé cleanserand moisturize using a light moisturizer or serum. Also it is very important to apply sun protection over your moisturizer. Acne causes the majority of people to "pick" at their skin, which only brings more bacteria to the face. If acne is a problem, you shouldn't pick, pop or use harsh products on your face. Type 4: Sensitive-Delicate: Sensitive skin tends to be thin and delicate with fine pores. It flushes easily, is prone to broken capillaries, is frequently allergic and can be rashy. It reacts quickly to both heat and cold; therefore, it sunburns and windburns easily. Temperature changes, some detergents, cosmetics and alcohol (used on the skin) can all cause irritation, leaving the skin red and blotchy, with visible surface veins. If you have this type of skin, use sun-screen lotions or creams. Choose products that do not contain potential allergens such as fragrance or PABA sunscreens. DAILY CARE: Cleanse your face with a gentle milk or cream cleanser, rinse thoroughly with tepid water and pat the skin dry with a soft towel; do not use a rough towel. Never use any makeup or perfume without first trying a little of it on the inside of your wrist to see the reaction of your skin to it, for very few items of makeup agree with a sensitive skin. Use a moisturizer both day and night to keep your sensitive-delicate skin hydrated and protected. Have questions about your skin type? Send us an email, we'll get back to you in 24 hours.